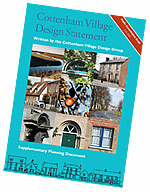 The original Cottenham Village Design Statement was prepared during 1994. Over the following years, both the village and the planning framework within which the document sits have evolved, with the result that the original Statement became less relevant than when it was first written. To ensure that the Design Statement remained an effective tool for guiding development within the village, the Cottenham Village Design Group carried out the process of revising the Design Statement during 2007. The 1994 document was thoroughly reviewed and brought up-to-date. Additional material was included based on the experiences of using the Design Statement to comment on planning applications over the preceding period. Further changes were made to comply with the requirements for adoption as a Supplementary Planning Document within the Local Development Framework for South Cambridgeshire. The process of updating the Design Statement was coordinated by the Cottenham Village Design Group, with contributions supplied by the Cottenham Environment Audit Group, the Cottenham Footpath Group, the Cottenham Wildlife Group, Cottenham Parish Council, Cambridgeshire County Council and Natural England. Early drafts of the Design Statement were also circulated to other key stakeholders to seek their opinions. These included South Cambridgeshire District Council, the Government Office for the East of England, Cambridgeshire Horizons, the Environment Agency, English Heritage, Cottenham Village Society, Fen Edge Community Association, and representatives of the Traveller community at Smithy Fen. 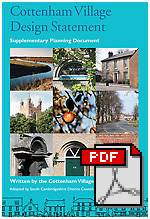 The draft Cottenham Village Design Statement was then published for public consultation from 20th July to 31st August 2007, providing the opportunity for individuals and organisations to consider the descriptions and guidelines put forward. Copies were distributed to all households in Cottenham and two public open meetings were held. Feedback from the consultation was then carefully considered and a number of amendments to the draft were made. A detailed Public Participation Report was also prepared. Finally, an amended draft was submitted to South Cambridgeshire District Council for consideration in October 2007 and the revised Cottenham Village Design Statement was finally adopted as a Supplementary Planning Document by the Council on 14th November 2007. The Design Statement was subject to a Sustainability Appraisal to assess its proposed guidelines in terms of their social, environmental and economic impact. The revised Statement was also subject to a Habitats Directive Assessment to ensure that it had no negative impact on any sites of importance for nature conservation nearby. Funding for the Design Statement update has been generously provided by Cottenham Parish Council (£698) and Awards for All (£6,282).